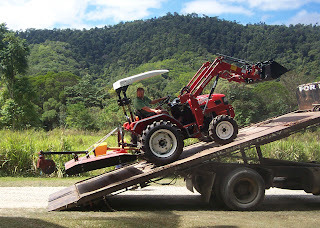 Daintree Valley Haven: Peter's new toy! Finally, the new tractor has arrived today and Peter has a shiny new toy to play with! So now he can catch up with all the jobs which had to be put on hold when our old machine broke down months ago (major problem which was too expensive to fix). Now to find out how ev erything works - first problem is that the manual is all in Chinese!!! Oh well, he'll soon work it all out as Peter's had plenty of experience with various types of tractors over the years. This one even has power-steering and a seat-belt!